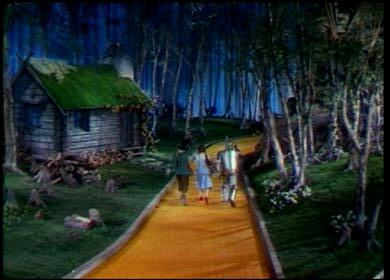 The scene where I see the hanging man is right when Dorothy, Scarecrow and Tin Man skip away down the Yellow Brick Road, right after the Witch shot a fireball down from a house. The line they are singing is, "All the wonderful things he does!". The camera lifts/pans right and in the top right corner there is the figure whose legs are tied and neck is tied. He sort of blends in with the trees, so it is not a distinct picture. I don't think it is a bird because it is suspended in the air and dangles. The figure is there for the whole scene. There also looks to be a shadowy image more blurry than the hung figure, who looks to be pulling the ropes ... am I imagining this or is it really someone being killed? This rumor is spreading like wildfire on campus. As soon as I received this e:mail I grabbed a DVD of OZ and raced to the scene in question. On a large television monitor, details as fine as differing shades of green in the foliage are really very clear. To analyze the scene I could also run the picture at a number of slow speeds, and pause to study clear still frames. Dangling man? Tied by the legs and neck? I saw nothing like what Alex describes. And the top right of the frame seemed the least likely place for anything to be hiding. There is nothing more up there than a few light trees and a piece of rock scenery. Savant's mind was racing toward conclusions of hoax, mass hypnotism or optical illusion when I noticed the birds .... as the scene widens, if you look just to the right and behind the house there is a small grove of trees set against a bluish - painted scenery backdrop. Square in the middle of this part of the set is a bird, some kind of heron, or stork, or something, silhouetted like the tree trunks against the backdrop. I have absolutely no doubt about this being a bird, because once during the shot it flutters its wings. Besides a ropelike neck, it has zero in common with an image of a hanging man. Could this be what viewers are seeing? To the left of this bird, closer to the house, is the shadow of a similar bird on the blue backdrop, which also reveals its true nature by flapping its wings at one point. Could this be what is being interpreted as a man pulling a rope? I feel more like someone is pulling my leg ... If there's really some mystery image in OZ, I hope a reader writes in and points me in a different direction, because so far this rumor, that's supposed to be burning down the campus, just isn't there. The Persistence Of Munchkins: A Conspiracy Theory About The Hanging Man!